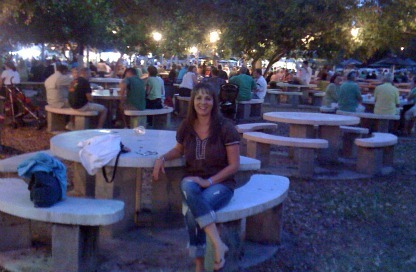 The Cape Coral Irish Festival is so much fun, with live Irish music, corned beef sandwiches and dinners, rides, and crafts. It's located back at the German American Club for this year! The venue features a walkway which loops around with booths and tents, and areas of tables where you can eat and enjoy music and dancing. Part of the loop has the section where you get your food and drinks. Another part has rides and games for the kids ...... and adults! The festival will be held March 2-3, 2019. 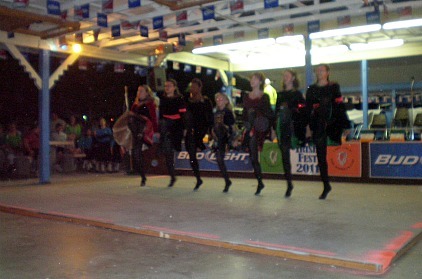 There are 2 stages, one for the bands and the other in the pavilion for Irish step dancing demonstrations, such as from the Kellyn Celtic Arts Irish Dance Academy. Then there are all the craft booths set up in various spot along the walkway. Many of the crafts are for Irish goods like: jewelry, blankets, tee shirts, and more. We sure enjoyed our corned beef sandwiches! The corned beef dinner also comes with cabbage, boiled potatoes and carrots. You can also get Shepherd's Pie, sausage and peppers, potato pancakes, and hot dogs. There's a raffle to win a trip to Ireland, music from bands both local and from further away. The festival is hosted by the Cape Coral Irish American Club. Contact them through their website or go directly to their Irish Festival page. We really enjoyed music by The Screaming Orphans and West of Galway, internationally known bands.